Time to start watching U.S. cities go bankrupt. Prior to Detroit, there was Stockton, California, and, according to Stephen Moore, now the chief economist with the Heritage Foundation, there are more than sixty of the largest cities that “are plagued with the same kinds of retirement legacy costs that sent Detroit in Chapter 9 bankruptcy” last year. At the time it declared bankruptcy, Detroit had 47 different public employee unions. The Detroit Water & Sewer Department had a farrier (a horse-shoer) who received $56,000 in pay and benefits every year even though the city had no horses in the department. 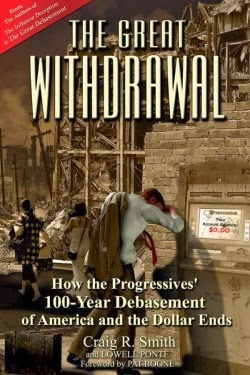 Recently published, “The Great Withdrawal” by Craig R. Smith with Lowell Ponte examines the damage that progressive programs and policies have done to cities and to the nation. A nation with a $17 trillion debt who’s President has only one answer, raise the debt limit, will encounter a financial Armageddon if the spending and borrowing is not sharply curtailed. Recall that President Obama claimed he had “saved” General Motors and Chrysler with bailouts that cost taxpayers “at least $25 billion that will never be paid back. At least a billion of these tax dollars went to improve GM facilities in Brazil, and at least $550 million went to GM facilities in Mexico.” Chrysler is now owned by the Italian automaker, Fiat. This describes what President has been doing since first elected in 2008. For the entirety of his first term, he blamed everything on President George W. Bush. “Put simply,” says Smith, “most progressive cities are welfare city-states in which a large percentage of the population lives on government money, either as government dependents or government employees.” This description fits the nation as well. With the passage and implementation of the Affordable Care Act—Obamacare—the Congressional Budget Office released a report predicting that, over the next decade, it will cost the nation about 2.3 million jobs and contribute to a $1 trillion increase in projected deficits. Hans Bader, a senior attorney at the Competitive Enterprise Institute, notes that it contains massive marriage penalties that discriminate against married people, huge work disincentives for some older workers, has slashed hiring, cut economic growth, and induced employers to replace full-time workers with part-time employees. In the process, millions have seen their healthcare policies canceled or replaced with policies with higher premiums and deductibles. There are already 92 million Americans who are unemployed or ceased looking for work. There are 47 million on food stamps. The ultimate progressive, President Obama, is impoverishing millions of Americans. Unlike Detroit, America cannot declare bankruptcy. It can only collapse if voters do not replace those Senators and Representatives that voted for Obamacare and who refuse to take the steps to reduce government spending and borrowing. We have three years in which to survive Obama. No government or public workers should be allowed to unionize UNLESS we, their bosses, get to vote on their wage and benefit increases! After all, we taxpayers pay their way. Right to work should be a national law. I don't object to private unions (although I know they are inherently inefficient) because competition will keep them in check. You will notice that the states that are profiting and growing now are mostly all down south and right to work states. Public employee unions have been bankrupting cities for a long time now and should, in my view, be eliminated. Thanks for your input. The good news is that America will survive Obama. After all, Rome survived Caligula and Nero. They are some grim numbers. Hugh credit card debt. Married couples walking away from mortgages and homes that they can't afford. Broken marriages and homes with their children walking the streets doing and selling drugs to survive. Gas and heating oil costs eating away their dwindling pay checks. Don't mention God, whoever you conceive him to be, it's not politically correct. Abortion is ok, the government says so. Couples sitting in front of a big screen TV bought with a over drafted credit card, getting fat eating junk food bought with food stamps watching stupid sitcoms. Why even worry about health care, if they're sick, just walk into a hospital, they can't be refused treatment. (It's been going on for years). But don't worry, Obama has everything under control. Painful? Maybe, but we either act and act soon or survival may be a moot point.. If there's nothing left to salvage we're ALL screwed.. THe funny thing is all those government workers when they retire from the craphole they worked in, they move south to Florida where it is cheaper to live(wonder why) but they bring their leftist mindset and vote for the same kind of politicians that ruined the place that they came from. This would explain the democratic enclaves in Florida like Broward, Miami Dade and other places.